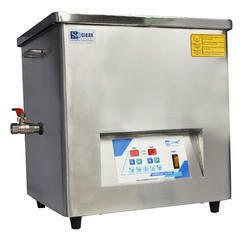 We offer wide range of Ultrasonic Cleaner For Electronics Manufacturing. These ultrasonic cleaners are exceptionally well made and also supplied as per our clients' specifications. Ultrasonic Cleaner for Electronics Manufacturing can produce parts with high precision that are made of hard and brittle materials which are often difficult to machine. It consists of a transducer of robust design, comprising of steel support framework, fully interlocked motorized mechanism for up/down movement and traverse mechanism. A set of limit/proximity switches are positioned which ensures correct stopping of the transporter at the process tank. Looking for Ultrasonic Cleaner For Electronics Manufacturing ?